home / Multimedia / The Holy Land in news / “Jerusalem! Pictures of the Franciscans in the Holy Land”: .. The exhibition is organized by the Fondazione Cariperugia Arte and the Centro culturale Aracoeli of the Friars Minor of the Roman Province of Saints Peter and Paul, with the sponsorship of the Commune of Assisi. A number of other organizations have been involved in preparing the exhibition, including Association pro Terra Sancta. 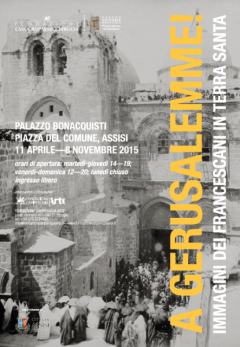 In addition to the historical photos, there will be a multimedia section where visitors will be able to view several videos on the Holy Land and Jerusalem, including a three-dimensional reconstruction of the Church of the Holy Sepulchre produced by Association pro Terra Sancta. 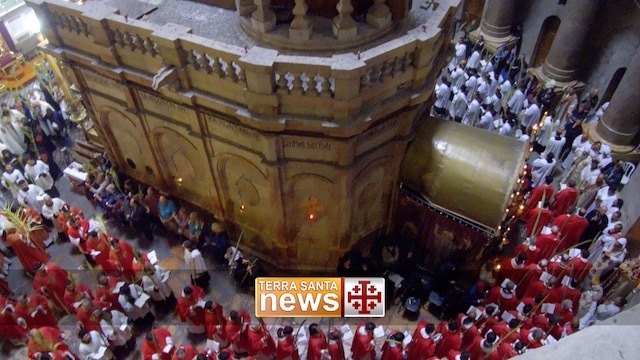 These videos are representative of the material to be presented in the multimedia section of the Terra Sancta Museum, whose inauguration is planned for end-2015. The exhibition continues until 8 November. Opening hours: Tuesday – Thursday, 1400 to 1900; Friday – Sunday, 1200 to 2000; closed Monday. Entry to the exhibition is free.